This page contains a list of Knights of the Order of the Golden Fleece. Jehan de Neufchâtel, Seigneur de Montagu ? ? Jean de Damas, Seigneur de Clessy ? ? Unico II, Baron Ripperda von Farmsum ±1413 ? Bertrem, Seigneur de Liechtenstein ? ? Claude de Toulonjon, Seigneur de la Bastie ? ? Pietro Antonio San Severino, Duke of San Marco ? ? Joachim, Seigneur de Rye ? ? Antonio Doria, Marquis of San Stefano ? ? Matteo de Capua, 2nd Prince of Conca ? ? Iñigo d'Avalos d'Aquino, 7th Marquis of Pescara ? ? Fabrizio Branciforte, 3rd Prince of Buteera ? ? Fabricio Carafa, Prince of La Roccella ? ? 1634 Etoro Ravaschiero, Prince of Satriano ? ? Francesco I d'Este, Duke of Modena 1610 1658 Brother-in-law of Maffeo Barberini (through his final marriage to Lucrezia Barberini); also a Knight of the Golden Fleece. Marcantonio V Colonna, 5th Prince of Paliano 1606/10 1659 Father of Lorenzo Onofrio Colonna and uncle of Maffeo Barberini; also Knights of the Golden Fleece. Lorenzo Onofrio Colonna 6th Duke of Paliano 1637 1689 Son of Marcantonio V Colonna and cousin of Maffeo Barberini; both also Knights of the Golden Fleece. Marzio Carafa, 7th Duke of Maddaloni ? ? Maffeo Barberini, Prince of Palestrina 1631 1685 Brother-in-law (by the marriage of his sister, Lucrezia Barberini) of Francesco I d'Este, Duke of Modena, also a Knight of the Golden Fleece. Alexander Farnese, Prince of Parma 1635 1689 Governor of the Habsburg Netherlands (1678–1682). Dominico Marzio Carafa, 8th Duke of Maddaloni ? ? Urbano Barberini, 3rd Prince of Palestrina 1666 1722 Son of Maffeo Barberini, also Knight of the Golden Fleece. 1689 Filippo II Colonna 1663 1714 Prince of Paliano and High Constable of Naples from 1689. Son of Lorenzo Onofrio Colonna; also a Knight of the Golden Fleece. Joseph Mario Orsini, 3rd Duke of Paganica ? ? Charles Carafa, 4th Prince of Belvedere ? ? Octavius, Marquis of Cavriani ? ? Nicolas Placido Branciforte, Prince of Pietrapercia ? ? Domenico d'Acquaviva et d'Aragon, comte de Conversano ? ? 1701 Philip V, King of Spain 1682 1746 Grandnephew of King Charles II of Spain. 1st head of the Spanish Branch of the Order from the King's death as his successor. 1747 Infante Felipe, Duke of Calabria 1747 1777 son of King Charles VII of the Two Sicilies (later Charles III of Spain) excluded from succession to the throne due to his imbecility. Jose Bonano Filangieri del Bosco, Prince of Rocafiorita and Cattolica ? ? Bartolomeo de Capua, 20th Count of Altavilla, Duke of Airola, Prince of Riccia ? ? Vicente Manrique de Zúñiga, Marquis of Aguilafuente and Count of Aguilar ? ? Fausto Francisco de Palafox y Rebolledo, Marquis of Ariza ? ? Henri de Meneses, Count of Ericeyra and Marquis de Lourizal ? ? Cristobal Pío Funes de Villapandro, Count of Atares ? ? Diego de Noronha ? ? Vicente María de Palafox, Marquis of Ariza ? ? Vicenzo Maria de Vera Aragon, Duke of la Rocca ? ? Francisco María del Castillo Horcasitas, Marquis of Villadarias ? ? 1795 Marquis of Oyra ? ? Miguel de la Grúa Talamanca, 1st Marquis of Branciforte ? ? 1796 Luis Pinto de Sousa ? ? 1798 Bruno Domingo Simon, Count of Lalaing 1739 ? Luis María de Borbón y Vallabriga, 14th Count of Chinchón 1777 1823 Archbishop of Seville and Toledo, Cardinal. 1829 Vicenze Maria Grifeo, Duke of Floridia, Prince of Partanna ? ? Donato, Marquis Tommasi and Casaliecho ? ? 1832 Girolamo, Marquis Ruffo ? ? Prudencio de Guadalfajara, Duke of Castroterrano ? ? Fernando de Aguillara, Marquis of Cerralbo ? ? Juan Baptista de Queralt y Silva, Count of Santa Coloma ? ? 1850 Louis Napoleon Bonaparte, President of the French Republic 1808 1873 later Napoleon III, Emperor of the French. Co-Prince of Andorra. Pedro Colón, Duke of Veragua ? ? Cirilo Álvarez Martínez de Velasco ? ? Émile Loubet, President of the French Republic 1838 1929 Co-Prince of Andorra. Invested by the Duke of Sesto, special representative, on 22 June 1902 at Paris. Alberto Manso de Velasco y Chaves, Count of Superonda 1828 ? 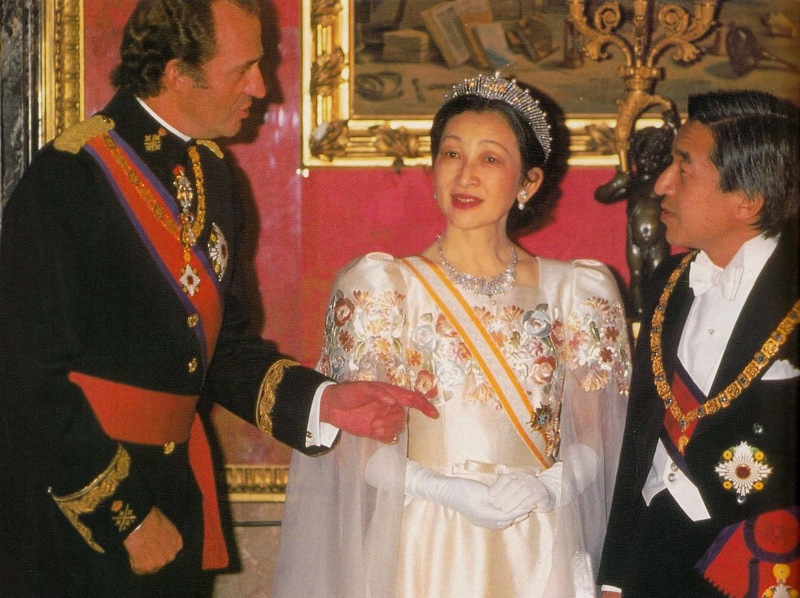 1985 Emperor Akihito of Japan - 1, 185th Knight 1933 - Honoured as Crown Prince of Japan. Princess Beatrix of the Netherlands - 1, 187th Knight 1938 - Former Monarch of the Netherlands, Aruba, Curaçao and Sint Maarten until Abdication in 2013. Queen Margrethe II of Denmark - 1, 188th Knight 1940 - Monarch of Denmark, Greenland and the Faroe Islands since 1972. 1988 Queen Elizabeth II of the United Kingdom - 1,189th Knight 1926 - also Queen of Canada, Australia, New Zealand, Jamaica, Barbados, Bahamas, Grenada, the Solomon Islands, Tuvalu, Saint Lucia, Saint Vincent and the Grenadines, Belize, Antigua and Barbuda, Papua New Guinea and Saint Christopher and Nevis since 1952. 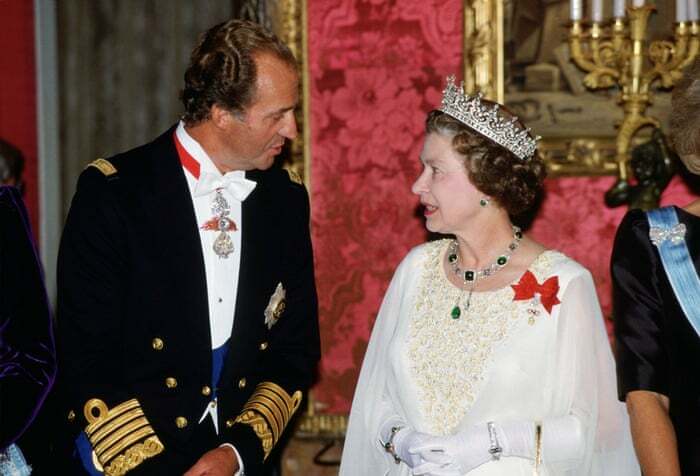 1994 King Albert II - 1, 190th Knight 1934 - Monarch of Belgium until Abdication in 2013. 1712 Rinaldo III, Duke of Modena and Reggio 1655 1737 Son of Francesco I d'Este and nephew of Maffeo Barberini; both Knights of the Golden Fleece. Francis de Blanes, Count of Centelles ? ? Alfonso, Prince of Cardenas and Count of Acerra ? ? George Thomas, Count of Starhemberg ? ? Louis Sanseverino, 10th Prince of Bisignano 1705 ? Joseph de Norona, Count of Montesanto ? ? Scipion Pubblicola, Prince of Santa Croce ? ? Michael John, Count of Althan 1710 ? Francis Louis, Count of Salburg ? ? Francesco, Count of Montecuccoli-Caprara ? ? Charles, Count of Ogara ? ? Rudolf, Count of Korzensky of Tereschau ? ? Leopold Krakowsky, Count of Kolowrat 1727 180? John, Baron of Hagen ? ? Rudolf, Count of Wrbna and Freudenthal ? ? Michael Francis, Count of Althan ? ? Ignaz, Count of Hardegg of Glatz and Machland 1772 ? Antonius, Count of Majlath 1801 ? Count Antonius of Cziraki 1850 ? ca. 1850 Infante Alfonso Carlos, Duke of San Jaime 1849 1936 Grandson of Carlos María Isidro, 1st Carlist Pretender. Futur 6th Carlist Pretender as Alfonso Carlos 1st. Karl was recognised by his supporters as Carlos VIII; his movement is therefore called carloctavismo or octavismo. He used the title Duke of Madrid as his grandfather had done. Karl received the support of some of the most conservative Carlist leaders. He also received a certain level of support from some of General Franco's officials in the Movimiento Nacional; the followers of the Carlist regent Prince Xavier of Bourbon-Parma claimed that the Francoist support was merely an attempt to divide Carlists. Karl moved to Andorra and then returned to Barcelona. Between 1944 and 1951 he gave out fourteen titles of nobility; he also named members to the Order of Proscribed Legitimacy and the Order of Santa Maria of the Lily of Navarre. He established a new order of merit named in honour of Saint Charles Borromeo. In 1952 he awarded the collar of this order to General Franco and the grand cross of the order to Cardinal Federico Tedeschini, papal legate to the International Eucharistic Congress in Barcelona. ^ It was recorded by Arnaud de Limburg Stirum that Charles was a Knight during the burial of Count Thierry de Limburg Stirum in 1968. ^ Reconoció a Alfonso XII como rey en 1875, confirmando el gobierno liberal ese mismo año sus títulos pero no el Toisón. ^ Los pretendientes carlistas mantuvieron su propia orden hasta 1931 aunque no se realizaron nombramientos posteriones. ^ Juan L. Sánchez. "Juan de Velasco y Henin (1609-1678), Conde de Salazar, Marqués de Belveder". tercios.org. Retrieved September 28, 2015. ^ "Juan de Velasco : précisez". roglo.eu. Retrieved September 28, 2015. ^ "Joseph Bonaparte nominated his own knights of the Golden Fleece from 1808 to 1813". antiquesatoz.com. Retrieved September 28, 2015. ^ "The Carlist Pretenders to the throne nominated their own knights of the Golden Fleece from 1845 to 1900". antiquesatoz.com. Retrieved September 28, 2015. ^ "Image: 25evfr6.jpg, (400 × 482 px)". i8.tinypic.com. Retrieved September 28, 2015. 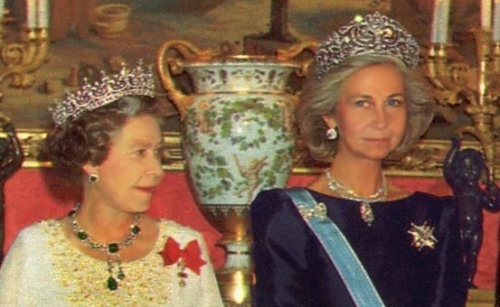 ^ "Queen Silvia wore this tiara for the first dinner during the Swedish State Visit to Spain in March 1983. | Connaught Tiara | Pinterest". pinterest.com. Retrieved September 28, 2015. 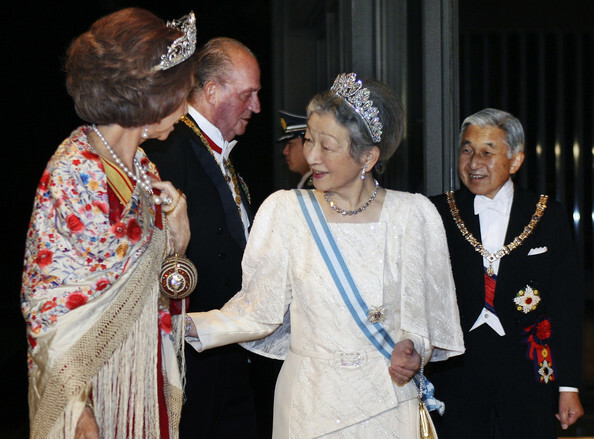 ^ "Image: King+Juan+Carlos+Queen+Sofia+Spain+Visit+Japan+K-SeZjfpke2l.jpg, (594 × 439 px)". www4.pictures.gi.zimbio.com. Retrieved September 28, 2015. ^ "Image: 1the%2Breception-H.M.%2BKing%2BJuan%2BCarlos%2BI%2Bof%2BSpain%2Band%2BHH.II.MM%2BEmpress%2BMichiko%2Band%2BEmperor%2BAkihito%2Bof%2BJapan.jpg, (1513 × 1131 px)". 1.bp.blogspot.com. Retrieved September 28, 2015. ^ "Image: 1172590-king-juan-carlos-of-spain-chats-with-dutch-gettyimages.jpg, (594 × 416 px)". cache2.asset-cache.net. Retrieved September 28, 2015. ^ "Image: 69368_E18_122_468lo.jpg, (640 × 426 px)". i377.photobucket.com. Retrieved September 28, 2015. ^ "Image: 3fc3b927-275a-4324-a1a7-b9d25b6fae74-1020x693.jpeg, (700 × 476 px)". i.guim.co.uk. Retrieved September 28, 2015. ^ "Image: tumblr_mwad0xx2fC1sltvyco1_500.jpg, (500 × 307 px)". 41.media.tumblr.com. February 1, 2008. Retrieved September 28, 2015. ^ "MADRID, SPAIN - MAY 22: Norwegian King Harald V and Queen Sonja arrive to attend the wedding between Spanish Crown Prince Felipe de Bourbon and former journalist Letizia Ortiz at the Almudena cathedral May 22, 2004 in Madrid. (Photo Getty Images)". Retrieved September 28, 2015. 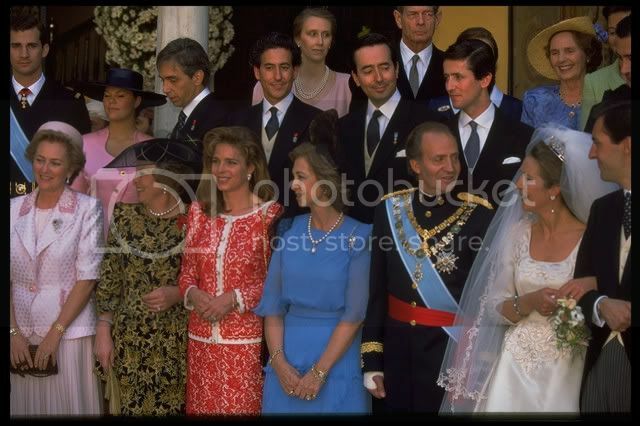 ^ "Image: King+Simeon+II+Bulgaria+Wedding+Prince+Guillaume+obyXmFjIrCOl.jpg, (411 × 594 px)". www2.pictures.zimbio.com. Retrieved September 28, 2015. ^ "Oct 19 - King Simeon II of Bulgaria and Queen Margarita of Bulgaria attend the Gala dinner in Luxembourg. | Pinterest". pinterest.com. Retrieved September 28, 2015. ^ "Luxembourg Grand Duke Suffering from Illness | Royalty in the NewsRoyalty in the News". Archived from the original on 2013-08-22. Retrieved September 28, 2015. ^ "Image: xin_3120404171117890310060.jpg, (400 × 286 px)". news.xinhuanet.com. Retrieved September 28, 2015. ^ Miguel Gómez Damas y no Manuel Gómez y Damas Índice de la I Guerra Carlista. las Guerras Carlistas: Actas de Historia. Consultado el 11 de noviembre de 2012. ^ Cevallos y no Ceballos, Índice de la II Guerra Carlista. las Guerras Carlistas: Actas de Historia. Consultado el 11 de noviembre de 2012. ^ Ceballos Escalera y Gila, A. La Insigne Orden del Toisón de Oro. Real Sociedad Económica Segoviana, 2000. ISBN 978-84-930310-2-2.